Sheri knew Kiara was the puppy for her when at her breeder's, Kiara climbed into her nephew's lap, curled up, and went to sleep. They brought her home Memorial Day Weekend in 2005. 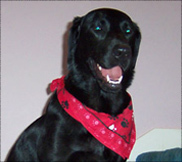 In February 2008, Sheri took out a pet insurance policy for Kiara, and shortly thereafter, she noticed that Kiara no longer wanted to walk on slippery surfaces and would yelp in pain when playing with her sister, Kaiya. A local veterinarian diagnosed her with tendonitis and prescribed Deramaxx and 6 weeks of rest. Kiara underwent a bilateral shoulder arthroscopy and radio-frequency treatment in September 2009. She is recovering nicely with the help of a physical therapist. Callie delighted in watching the birds outside and chasing balls and laser lights around her new home. But her parents noticed that she was becoming winded after just a few minutes of play. Over a period of weeks she went from simply being winded after play to developing a prolonged, rasping cough, sometimes followed by vomiting. Callie was taken to the Veterinary Medical and Surgical Group in Ventura, Calif. Upon examing Callie the veterinarian determined that she was suffering from feline asthma. 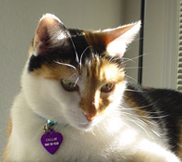 The radiology consultation had found a collapse of Callie's left cranial lung, likely resulting from feline asthma. Callie's treatment included a special, one-month steroid and an inhaler. After completing her treatments, she felt no ill effects and her episodes have stopped. She is once again happily chattering at the birds and chasing her balls and laser light.